Firstly, there’s a map at the bottom of this post…plus: NEW: Summer in Órgiva 2018. 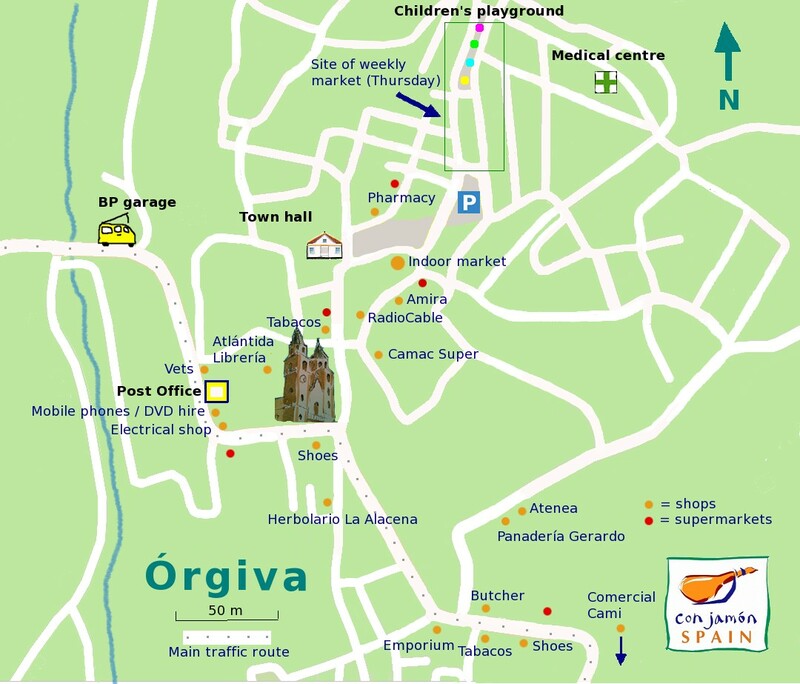 Here’s our guide to the shops in Órgiva. You can also read about the supermarkets, places to get Wi-Fi and internet and the weekly outdoor market. There are obviously more shops than this in town, but we can’t fit them all on. The place to get fresh herbs, runny yogurt, health food, organic vegetables and so on. It’s tucked away on a steep road approaching the main church near Nemesis nightclub. Open 9.30am to 2pm, 5.30pm to 8.30pm every day (except Sundays). Note: August, closed in afternoon. Calle Yañez. Our favourite bakery in town for its interesting bread – like a seedy, malty black bread. Sells croissants. Also has a wide selection of sweet things. Delivers too. Opens from 8am every day (including Sunday mornings). Calle Lora Tamayo. In short: Cadburys flake, fish sauce, Marmite, jam, mustard, baked beans, Blue Dragon Thai paste, Belvoir cordials, vanilla pods, Fisherman’s Friend. You get the picture. A life-saver for some. Open 10am to 2pm every day (except Sundays). Calle Real. A cool, open space on the north side of the main square with a minimalistic display of products. Usual stuff and where you can get your prescriptions from. If it’s closed look for the sign on door explaining location of alternative pharmacy (3 minute walk away). The place to get stationery, postcards. maps, toys and books – you can even get guitar strings. It also has a photocopier. Opposite is Galería del Marco which does picture framing and has art materials. Open 9.30am to 2pm, 5.30pm to 8pm, Monday to Friday; 9am to 2pm Saturdays. Calle Cristo de la Expiración. Cute little bookshop catering for both adults and children. Also has art material and maps. Next door to Panadería Gerardo. Open 9am to 2pm, 5.30pm to 8pm every day (except Sundays).Calle Lora Tamayo. There are two next door to each other up from Dia supermarket. Our favourite is the one by the bus stop almost on the corner. Lots of choice and the quality of fresh meat is good. Open 9am to 2pm, 5.30pm to 8pm every day (Sundays 10am to 2pm). Avenida Gonzalez Robles. Situated on the lower level of the indoor market by the main square. It’s open Tuesday to Saturday, 9am to 2pm. Great little place to print flyers, posters, signs and, more simply, photocopies. Open 9am to 2pm everyday (except Sundays). Calle Cristo de la Expiración. Currently not on map, but it’s behind the church. This lovely shop sells decent clothes, jewellery and loads of other stuff. There’s always a joss-stick on the go, too. Say ´hi´ to the resident dog, Maya. Open 9am to 2pm, 5.30pm to 8pm every day (except Sundays). Avenida Gonzalez Robles. (currently not on map but opposite Supermercado Alpujarra). This brilliant place almost out of town to the south sells: pet food (plus flea and worming treatments), seeds, garden stuff, barbeques, tools, ladders and much more – even hammocks. Open 9am to 2pm, 4.30pm to 8pm, Monday to Friday; 9am to 2pm Saturdays. Avenida Gonzalez Robles. It’s a Movistar shop, which has good coverage here. Also DVDs to rent at €2.50 a day. Also bits and pieces for phones, headphones and blank CDs. There’s a Vodaphone shop around the corner too. Open 9am to 2pm, 5.30pm to 8pm every day (except Sundays). Avenida Gonzalez Robles. A recommended vet is Dur-Can at the top of town near Café Willendorf. Comercial Cami sell pet stuff. Dur-Can vets is open 10am to 1pm, 5.30pm to 8pm, Monday to Friday. There are two in town. One near the church and the other, with a decent selection of magazines and papers, to the south almost opposite Dia supermarket. Open 9am to 2pm, 5.30pm to 8pm every day (except Sundays). Calle Doctor Fleming (near the church) and Avenida Gonzalez Robles. This is both an internet café and a place to get broadband installed and fixed. It also has booths where you can phone home. And if you want to complain when the service fails, here´s their number: 958 998 110. Open 9am to 2pm, 4.30pm to 8.30pm, Monday to Friday; 10am to 2pm Saturdays (closed Sundays). Calle Correo. Varied items on sale here from clothes, joss sticks to children’s toys, jewellery and gifts. A nice place to potter around. Open 10am to 2pm, 5.30pm to 8.30pm, Monday to Friday; 10am to 2pm, Saturday). Calle Correo. Forgotten your continental plug adapter? This is where to get one – as well as a vast array of other sockets and cables. They probably know an electrician if your place falls into darkness. Open 9.30am to 2pm, 5.30pm to 8pm, Monday to Friday; 9am to 2pm Saturdays. Avenida Gonzalez Robles. Best if we just link to our post about it. Shops and supermarkets close on Sundays. Your best bet – for wine, cheese, meats and sweets for the kids – is Los Arcos Bodega opposite the larger of the BP garages (the one on the way to Lanjarón – note the garage on the map below is the smaller version, just keep heading out of Órgiva on the same road). There’s also a vegetable shop near the post office, a small sweet shop around the corner from the church by the traffic lights (9.30am to 2.30pm, 4.30pm to 9.30pm) – and its sister shop next to the car park which has a small deli counter, a few tins, drinks and so on. The butcher marked on the map below also opens from 10am to 2pm. It also sells a small selection of beers, wines, tinned and packet food. In nearby Lanjarón, a small supermarket (Coviran) – opposite La Caixa bank on the town’s main thoroughfare – opens between 11am to 2pm. A favoured spot is behind the small BP station (also includes under the bridge if this is busy). Thank you! Thank you for the tip! I see the BP station after crossing the bridge but I am not sure where should I go from there. I see that road splits, should I turn in Calle Fuente Mariano and look for parking there? Alas the shop by the car park is now a dentist. May be a good dentist, but not much use for beer and milk on Sunday. Really good website/blog btw. Hi Jennie – we believe a new dentist has opened and it’s easy to get appointments (at the moment) as she’s new. No worries about beer and milk on Sundays – just up by the car park at the top of the steps the ‘sweet shop’ is open on Sundays for basics. Thanks for the nice words! Keep checking back. Excellent resource – well done!